One of the strengths of the Apple Watch since its release has been that it handles all of the expected tasks of a smartwatch and fitness tracker with all day battery life. I have used a Watch since day one, and have rarely had any kind of battery life issues over the last two plus years. While Apple certainly isn’t the only wearable manufacturer to pull this off, they are the only one to do so with a device that has both a reasonable size and a gender-neutral design. These are two big reasons that Apple now finds themselves at the top of the entire wearables market. However, with new features such as on-device LTE and Apple Music Streaming, that day long battery life can start to come up pretty short, pretty quickly. Portable MFi battery packs aren’t new. They have been around for a couple of years now and have always had their uses for a segment of Watch users. However, with the Apple Watch’s new features and the battery demands that come with them, now is the time when they will become more mainstream. I have been doing some research and picked up two that look promising for different reasons. 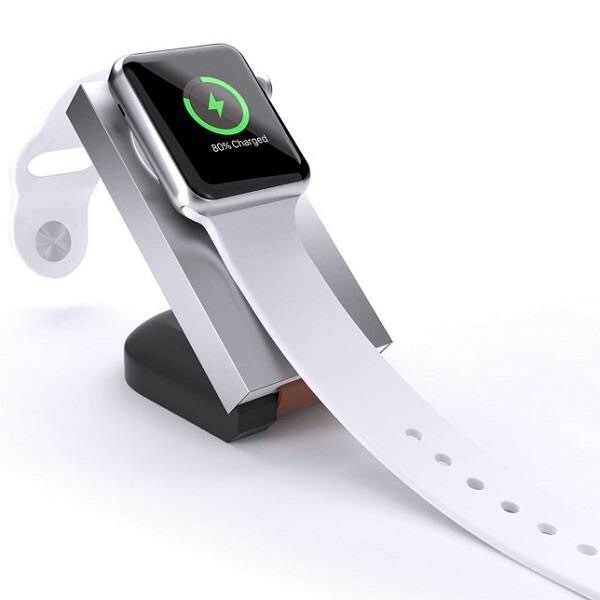 Belkin’s Valet is one of the more versatile MFi battery solutions for the Apple Watch. It is one of several on the market that has a built-in magnetic charging disk for the Watch, but what really sets the Valet apart are both its ability to pull double duty and its ample battery capacity. It has a USB-A charging port in addition to the Watch Charging Disk, meaning that the Valet can be used to recharge pretty much any electronic device that you have. The Valet also has one of the bigger battery capacities that you will find on a Watch battery pack, clocking in at 6,700mAh. Belkin claims that the Valet will recharge an Apple Watch 16 times at this capacity, and to be honest, that should be realistic. By the numbers alone, the 6,700mAh should be enough to charge a 279mAh Series 3 battery 24 times. However, with loss of efficiency due to heat and other factors, the numbers will never match up directly. Regardless, Belkin’s claim should be pretty accurate. As for my own testing, I can tell you that I have charged both my iPhone X and Apple Watch Series 3 using the Valet two nights in a row. The X was under 20% low in both cases, and it has a capacity of 2,716mAh. Combine that and the Watch, which was also down around 20% at the end of the day, and you have close to 3,000mAh of connected capacity. In both cases, I went to sleep listening to music with a playlist that would last around two hours. Also, you have to bear in mind that the devices will continue to trickle charge once they are at 100%. I slept in both mornings, since I have vacation and holiday time from my day job for Thanksgiving, so both devices were connected to the Valet until around 9:30 AM. Both days, the Valet had 1 “dot” out of four (LED battery indicators) remaining. This indicates up to 1,675mAh left, and since the devices were still indicating charging when I got up, I know that there was some amount of capacity left over. Considering all of the factors, I don’t think this is performance is at all disappointing. If you are looking for a battery pack that can fully charge your Watch on the go, as well as pulling double duty topping off your phone, the Valet can definitely handle it. That said, the Valet isn’t quite perfect. I didn’t like the fact that it is not possible to re-charge it while other devices are connected. For example, the Valet would be the ultimate road warrior device if you could charge it while the Watch and your iPhone are connected at night, and then leave in the morning with it at full capacity and ready to act as your battery backup. This wold keep you from ever having to worry about bringing an Apple Watch cable on road trips. Unfortunately, I tried and this doesn’t work. Also, while I like the quality and premium feel of the hard plastic body, I feel like the aluminum will take a beating and get scratched up if you are tossing the Valet in a pocket or bag with other items. The weight of the Valet also will make it stand out when carrying it in a pocket, but that should be expected with a battery pack with this combo of a Watch magnetic charging disk and battery size. Despite these small criticisms, the Valet is still a well-designed, well-constructed, and very useful device. However, the price tag at somewhere between $85 and $99 may be somewhat prohibitive for some buyers. Bottom line- if you need a battery to top off your Watch on the go, and prefer more capacity and versatility, the Valet is a very good option if the price isn’t too high for you. You can purchase the Belkin Valet from Amazon for $85.56 here. 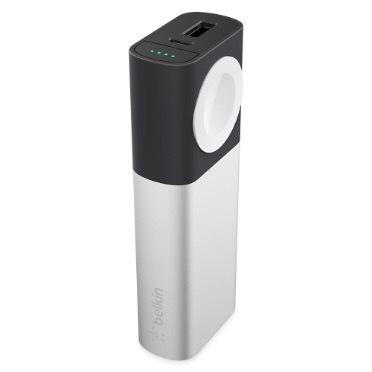 While the Belkin Valet is more about capacity and versatility, Griffin’s Travel Power Bank is all about portability. This is a Watch-only MFi battery pack that also has a built-in magnetic charging disk. However, the Power Bank has a much smaller size and battery capacity, and is meant to be convenient to carry anywhere. 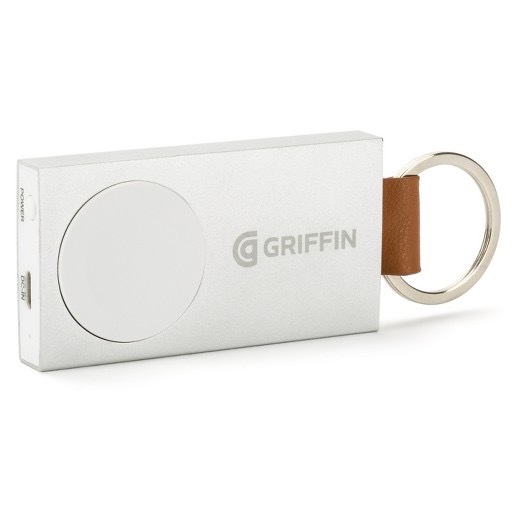 To drive the point home, Griffin included a key ring at one end of the Power Bank. In my opinion, this device is a little bulky and heavy to use as a key ring, but to each their own. It may be just fine for some. What I found interesting is how Griffin used the ring for another, more creative purpose. The Power Bank comes with a small, but somewhat weighted base that connects using the ring, turning it into a portable stand. With the Power Bank tilted back slightly, your Watch is held securely by the magnetic charging disk in either horizontal or vertical orientation. This is perfect for charging the Watch in its Nightstand Mode at night. One big positive in my book is that the Griffin Travel Power Bank WILL allow you to charge your Watch while simultaneously re-charging it. When you consider that it has a smaller battery capacity of 1050mAh, which Griffin estimates is enough for two full charges of your Watch, this is key. This capability allows you use the Power Bank as Watch charger at night, and then take it with you fully charged for use during the day. When I stay out of town in a hotel room, I need a way to reliably charge my Watch overnight. I can bring the Griffin Power Bank and leave my Watch’s charge cable at home without worry. I don’t have to depend on the Power Bank’s battery to charge the Watch, since I can charge both at once. Then I know I’m covered if I want to stream Apple Music or use LTE for an extended period the following day and need to top off. The one small negative is that the Power Bank is also likely to be a scratch magnet. The plastic construction is a little more practical than Belkin’s Valet, if a little less polished. However, I fear the silver colored finish on the outside won’t last. 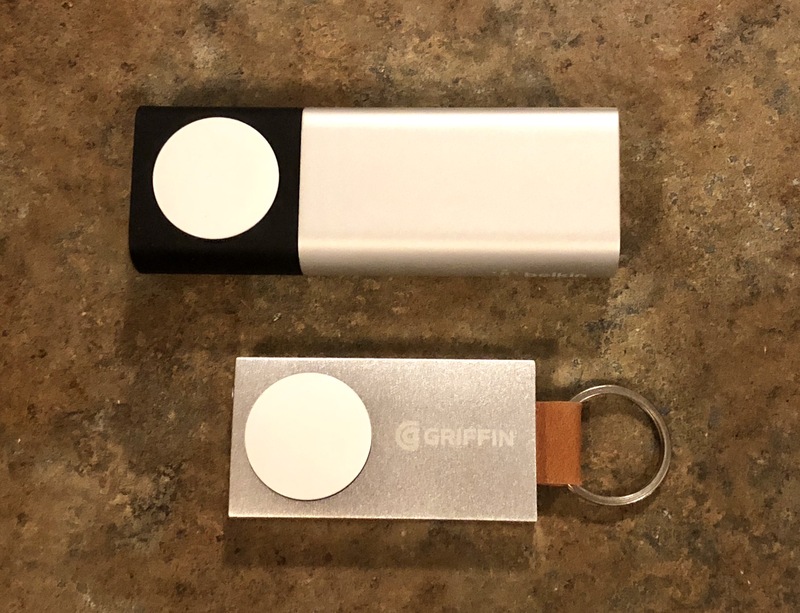 That said, when you consider the positives along with the very affordable $39.99 price tag, I think the Griffin Travel Power Bank is an easy recommendation for Watch users who have a need to top off their batteries on the go. I’m going to be hanging onto the Power Bank and using it myself on the road until something else comes along that can knock it out of the box. 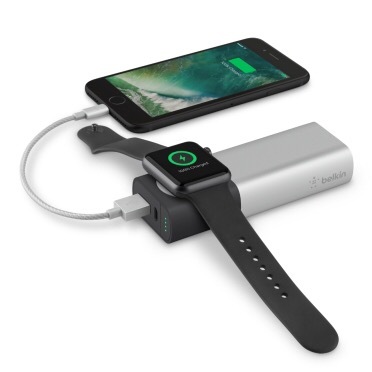 The Belkin Valet Charger Power Pack and the Griffin Travel Power Bank are by no means the only options when it comes to MFi battery packs for the Apple Watch. However, they come from two name brands with solid track records, and both products add a little extra beyond just simply charging your Watch on the go. While I think the Belkin Valet is a solid choice for those looking for one charger that will work for multiple devices, the Griffin Power Bank is the better value of the two. While it may not charge other devices, at this price you can spend just a little more than you would on the Belkin Valet and get yourself a higher capacity battery pack or case for your iPhone to go with it. I will likely be taking a look at a couple of other MFi Apple Watch charging solutions for review in the near future. However, for now, I think the Griffin Travel Power Bank is the one to buy. You can find it at Amazon for $39.99 here. The Belkin Valet Charger Power Pack and the Griffin Travel Power Bank were both purchased by the author for review on iPas Insight. For further information regarding our site’s review policies, please see the About page.